Kendal and Stewart shine in a bland adaptation of Coward's dated classic. Another year in the West End, another production of Hay Fever emerges, or so it seems. 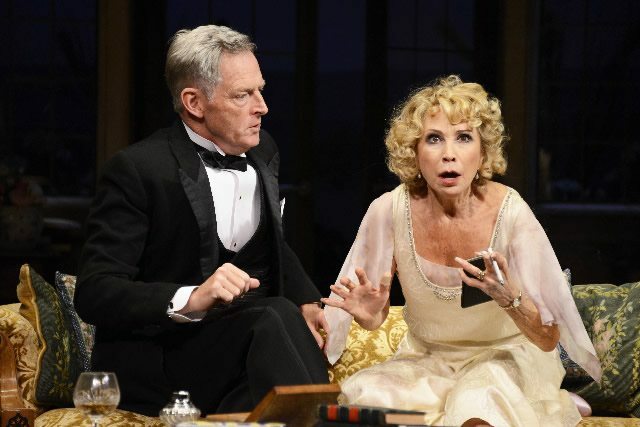 Noël Coward’s celebrated text has been widely performed in the past 90 odd years and is back once more, this time with Felicity Kendal playing the lusty matriarch, Judith Bliss. I like a good chuckle and I was expecting Hay Fever, a farcical romp through an afternoon at a country house with a robust and self-absorbed family, to be just the tonic for me. Unfortunately the most the show managed to provoke were a few titters from me, leaving me with the feeling that Lindsay Posner’s production of this much revived classic had nothing particularly new or exciting to contribute. Unfortunately on the evening I attended the show, admittedly in a late preview, it seemed that Kendal was ill. Power to the professional, she soldiered on through the play fully in character, just a little inaudible at times. With her innate ability to play sauciness (like her character in an awkward game of charades) and her unique sense of characterisation, it was clear that Kendal is the main draw to this production, I just wish I had seen her fully on form. Nonetheless, she dazzled in a way that only she can whilst making impressive use of an onstage hanky. There was plenty of energy in the piece, however instead of a slow build to the crazy climax of Act 2, I felt a bit bombarded with the zany idiosyncrasies of the Bliss family members almost immediately. For example daughter Sorel (played by Alice Orr-Ewing) was shrill to the point of hernia inducement after about ten minutes. That said, the bedlam of acts one and two gives way for a delightfully quiet third act, in which household guests are trying to very quietly have their breakfast and leave without waking their hosts. This change in tempo and rhythm makes for great viewing and some moments of rather pleasing tension. As Coward himself once claimed, Hay Fever “has little plot and remarkably little action.” I couldn’t agree with him more. Why we needed another production, I don’t know. This is a solid adaptation, sure, but it’s all a bit shrill and throwaway. Next time someone revives this “classic,” can we please at least set it on Mars or something, with the bliss family a quartet of randy aliens? !